Finally: A thoroughly AMAZING, GLORIOUS Shadow Mage class!! This pdf clocks in at 33 pages, 1 page front cover, 1 page editorial, 1 page ToC/Introduction, 6.5 pages of SRD, 1 page back cover, leaving us with 22.5 pages of content, so let’s take a look! One look at the shadow weaver base class makes that clear if you skipped the intro: The class gets d6, 2 + Int skills per level, ½ BAB-progression and good Will-saves and proficiency with simple weapons and light armors. In short: This is actually a shadow-themed full caster! The shadow weaver uses Intelligence as the governing spellcasting attribute and is a prepared spellcaster. HOWEVER, unlike a wizard, the shadow weaver’s spells are NOT expended upon being cast – instead, the class consumes a spell slot of the appropriate level. Metamagic may be spontaneously applied and increases casting time if this is done – like a spontaneous spellcaster handles these. HOWEVER, at the same time, the shadow weaver can elect to prepare the spells in question in advance with metamagic applied – in this case, they do NOT increase their casting time. This increased flexibility means that the class, pretty much from the get-go, provides a bigger value for taking metamagic feats, making them more viable – a fact I generally applaud. Now, as a medium for storing spells, the shadow weaver treats his shadow as a kind of spellbook – the shadow weaver’s shadow is also infused with shadowstuff, which allows him to cast spells with the [shadow] descriptor while not on the plane of shadow. Cool: Shadow weavers may study the shadows of spellcasters to transcribe these spells, provided the spells are on the class’s spell list. The shadow weaver is automatically cognizant when a creature succeeds a Will-save to disbelieve a shadow weaver’s illusion. This disbelief, though, infects the psyche of the shadow weaver – all observers of such an illusion automatically disbelieve it, which does not end the illusion, unless it is a phantasm. This is a REALLY smart balancing mechanic right there. The shadow weaver gains an additional spell with the darkness or shadow descriptor at each spell level, gaining such a bonus spell at every odd-numbered level after 1st. Additionally, spells cast by the shadow weaver can superficially resemble other spells: Illusions can resemble any spell, but spells of other schools are limited to looking like other spells from the same school. This even fools detect magic (YES! ), but can be noticed via greater arcane sight etc. Components, which would otherwise be a tell-tale sign, seem to vanish, btw. – identifying such a spell is hard; the ability increases the DC to identify it by the shadow weaver’s class level. Disbelieving one of the shadow weaver’s illusions does btw. NOT allow for automatic Will saves to disbelief the others – this ties in with the re-jigged illusion-balancing mentioned before. There is one more crucial component to the class’ spellcasting engine that needs to be mentioned: The shadow weaver’s spells are classified as umbral spells: They have thought components and emotion components, somewhat akin to psychic spells. Thought component spells have a concentration DC of +10 unless the shadow weaver previously spent a move action to center herself. Unlike psychic spells, umbral spells may be cast while under the effect of an emotion effect, though the base concentration DC is equal to the spell’s save DC + twice the spell’s level. Some umbral spells may be undercast, following rules analogue to those of psychic spells. At 2nd level, the shadow weaver gains silhouette – an illusion stitched to her own shadow, which maintains a constant effect. The Will save to disbelieve the silhouette, if any, is equal to 10 + ½ class level + Int-mod. If an observer has successfully disbelieved a silhouette, he is immune to that shadow weaver’s particular silhouette’s effects for 24 hours. Only one silhouette may be in effect at a given time. There is no action given for the switching of silhouettes, which makes me believe that the switch is free. A new silhouette is gained at 7th level and every 5 levels thereafter. These sport some SERIOUSLY cool options: Like making someone who disbelieves your illusions believe that he may be disbelieving existence itself – on a failure of the save, the target refuses to disbelieve anything! This ability is great, as it can screw with the PC AND the player. Prolonging spell effects, anchoring illusions (swift action illusion maintenance) and equipment made of shadow – there are some seriously evocative tricks here and we can also find a Tiny shadow companion. Starting at 12th level, silhouette selection is expanded to include the greater silhouette choices, including e.g. the ability to gain the dread’s shadow twin, mirage arcane with 50% real false conjuration VI-effects – really creative, cool, complex tricks here! Starting at 2nd level, the class gains weave reality, which is a second array of supernatural abilities – these have their saving throw DCs governed by Wisdom and 5th level and every 5 levels thereafter yield an additional daily use. Weave reality’s benefits are gained in a linear manner: At 2nd level, if a target is adjacent, enchanted or demoralized, the shadow weaver may force the creature via an immediate action Will-save against it to accept the illusions. 3rd level unlocks lighting control. At 8th level, the shadow weaver may channel hit points between two living or two undead targets. Starting at 10th level, the shadow weaver may unleash cones of energy, opposing energies witnessed last round – negative energy heals undead, positive the living and the elemental oppositions are concisely codified. Really cool! At 16th level, the shadow weaver may render a target creature quasi-real and at 18th level, the ability-suite nets the ability to polymorph any object serious amounts of matter. Starting at 4th level and every 4 levels thereafter, the shadow weaver adds one divination, enchantment or illusion spells from the cleric, druid, psychic, sorcerer/wizard, shaman, or witch spell list, storing it in the shadow. 4th level yields piercing glimpse: Basically, a sense-based option that ranges from constant aura sight to darkvision (or an upgrade thereof), a further bonus when gaining circumstance bonus to atk, saves or AC due to position etc., better Sense Motive, wild empathy – you get the idea. 9th level and every 5 levels thereafter yields another piercing glimpse and, if applicable, the governing attribute is Wisdom. 14th level enhances the selections available to include blindsense, etc. 14th level yields 3/day, maximum 1/round move action shadow step. That’s not all, though: The class also has a bloodline-like ability-suite: Chosen at 1st level, this is called “Perspective” – each perspective modifies the spell-list of the shadow weaver is meaningful ways (and yes, e.g. the curiosity perspective allows for synergy with Purple Duck Games’ glorious illuminatus chaos mage’s wonder-engine!) and each perspective nets a 1st level ability, one that is gained at 6th level and determines the capstone. These abilities grant massive, meaningful tweaks to the engine: Take duality of probability: You gain 1 + Wisdom modifier luck points. When attacking, saving, using a skill or CL-check, you can choose to roll twice and take the lower result – if you do, you gain a probability point, which may then be used as an immediate action to roll twice the effects of a wonder, ability or attack, including an illusion’s full effect – this limit prevents cheesing. Increased reality and capstone full reality can be found in the same suite. A total of 7 such perspectives can be found herein and from mimicking spellcasting (with a limit) to using Wisdom or Charisma as governing recall and perfect recall to an animus companion or channel energy, the perspectives represent major, meaningful tweaks of the base engine of the class. The pdf comes with a MASSIVE class spell list and false versions of abjuration, necromancy, etc. in 9 iterations each, allowing for maximum shadow spell flexibility. The pdf comes with 4 feats for quicker piercing glimpse change to extra silhouette and piercing glimpse. Another Perspective allows you to add spells of another perspective to your spell list at 1 level higher. Editing and formatting are top-notch, I noticed no serious hiccups. Layout adheres to a gorgeous two-column full-color standard and this pdf IS DENSE. There is a TON of text on each page – the margins are small. This sports a lot of content. The original artworks deserve special mention – a cool iconic that’s not rail-thin gets two thumbs up for me, diversity-wise, and the character looks badass, big time! The pdf comes fully bookmarked for your convenience. Lost Spheres Publishing went completely under my radar until one of my patreons requested me taking a look at this file. If this class by David N. Ross is any indicator, then that is an oversight I need to remedy ASAP. I don’t know if developer Christen N. Sowards changed a lot, but the result that came out of design and development is utterly beautiful: We not only get player agenda and meaningful choices left and right; the class can be played in a wide variety of meaningful, different ways and the class is AMAZING, allowing for the flexible, rewarding use of illusions and shadow spells – this is, in short, my favorite full spellcaster class in AGES. 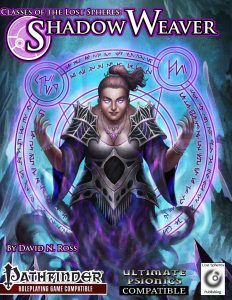 The shadow weaver does a ton of unique and interesting things with the spellcasting engine and, from spellcasting to the abilities gained, it is a thoroughly rewarding, complex and fun class. While it doesn’t sport much supplemental material (FCOs etc. ), that remains my only true gripe. The shadow weaver plays even better than it reads: The perspectives offer playing experiences so different from one another that most archetypes out there deliver less. Add to that the customization options and spells and we have a cornucopia of unique and cool tricks. In short: This is the excellent full shadow caster we always wanted. Taking the top tier design difficulty into account and we have a major gem of a class here that deserves being added to your roster -5 stars + seal of approval, given without the slightest hesitation. The only reason this is not a candidate for my Top Ten of 2017 is that it doesn’t sport that much supplemental material – still, get this glorious gem!! You can get this thoroughly EPIC, amazing class here on OBS!